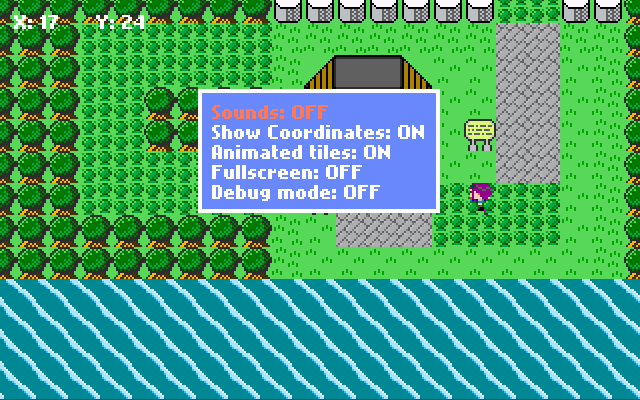 In the screenshot above you can see that I have added a ‘show coordinates’ option, this will display the current x and y position of the player in the top left corner of the screen. Having this in the production version might be useful for people who follow guides to find secrets in the game. By default the option will be disabled. The menu structure was made last year. There is an offset which can easily be spotted: the menu has a tendency to expand upward when more items are added. In the previous games I made, the number of items was limited to a fixed number, due to the size of the screen. For this game I want to have an unlimited list of items possible (well, maybe less then MAX_INT). In the image below you can see what I want it to look like. When pressing up while in the item menu, it will scroll through the items in the inventory showing a small selection of items. In order to solve these issues, I might have to rewrite the menu system.